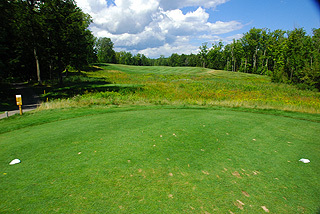 Greywalls is a premier 18 hole championship design and the more challenging of the 2 courses on property at Marquette Golf Club. Also on property is the Heritage Course, which was originally a nine hole layout designed by William Langford and Theodore Moreau in 1926, with the second nine added by David Gill in 1969. There is a driving range and practice green on property, along with a spacious restaurant/lounge serving a variety of food options and beverages. 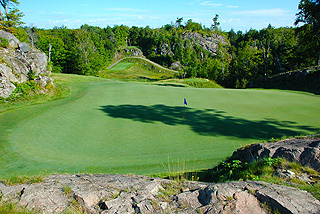 Designed by Mike Devries in 2005, this revered layout features panoramic vistas along and rough and tumbling terrain, featuring granite outcroppings and backdrops, with considerable elevation changes from tee to green on many holes. 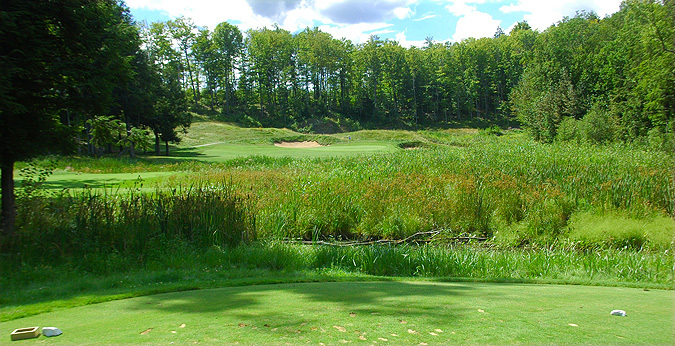 Want to experience Northern Michigan golf? You will get it here! 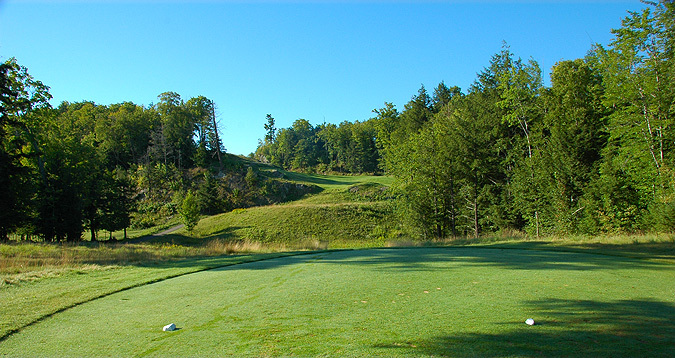 Greywalls was built with the natural environment in mind - thus the dramatically contoured slopes and fairways, tree lined landscaping and breathtaking views. 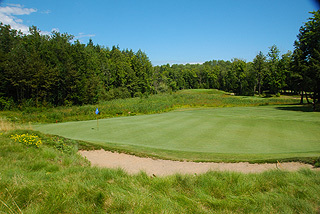 Upon Opening, it was named one of the top new courses in Michigan! The 150 and 100 yard stakes on all the par fours and fives serve not only to mark the yardages, but also provide targets off the tee, especially on holes with blind landing zones. 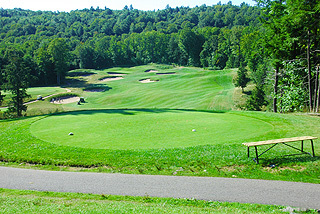 Those playing Greywalls for the first time are advised to pay attention to the tips and details presented by the starter, who will take the time to provide some valuable information on how to play some of the most challenging holes ( IE hit towards the red striped 100 yard stake on the par four 5th). It is also recommended that you pay attention the pin placements, as the sloping greens make for some difficult lag putts. Be sure to use the yardage booklet that is given to each group. There are 4 sets of tee boxes that play to yardages and slopes measuring 6828 yards/144 slope, 6537 yards/138 slope, 5908 yards/130 slope, 5258 yards/118 slope for men and 137 slope for women, and 4631 yards/121 slope from the front tees. Notice the high slope rating…you might want to move up a set, especially if playing for the first time. Red, white and red flags on the quick, sloping putting surfaces indicate front, middle or back pin placements. Sprinkler heads also provide measurements to the center of the green. 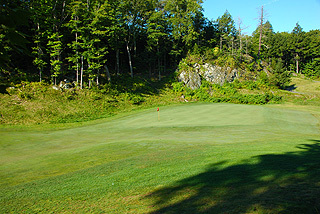 The slopes of some green complexes encourage golfers to hit towards the fringe and let the ball release to the flag. Course knowledge really comes in handy on this course! Bunkering is strategic and not overstated, with approximately 35 sand traps located near the landing zones or situated greenside. 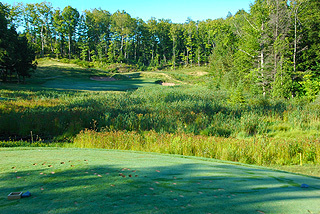 There are no ponds or lakes or ponds on the course, but ravines and natural areas create the need for carries off the tee and on approaches on several holes. This is one incredible golf course, and the superintendant does a wonderful job of maintaining the outstanding playing conditions. 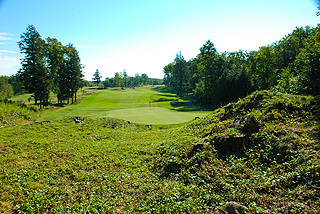 Bring a camera, don't be in a rush – enjoy the round and the spectacular scenery. 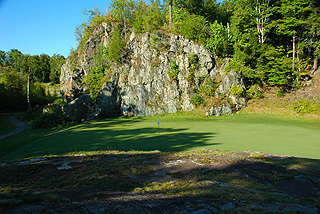 With the Heritage course also on property and 2 other top notch courses in the region - a 2 or 3 day golf trip to this part of the upper Michigan Peninsula is highly recommended. For more info visit our page for the course, with direct link to their website by clicking here.